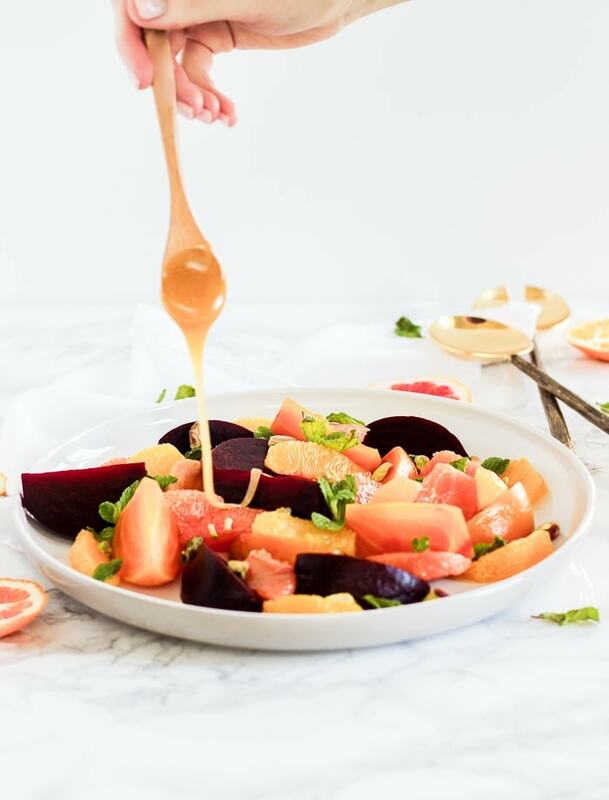 THIS gorgeous Citrus beet salad! I mean really, if you think about the prettiest foods out there, what do you come up with? 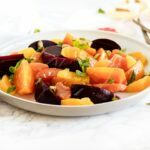 For me, beets and citrus are both well within the top 5. Those colors and beautiful patterns just brighten up the most dreary of winter days, don’t you think? Nature amazes me sometimes. 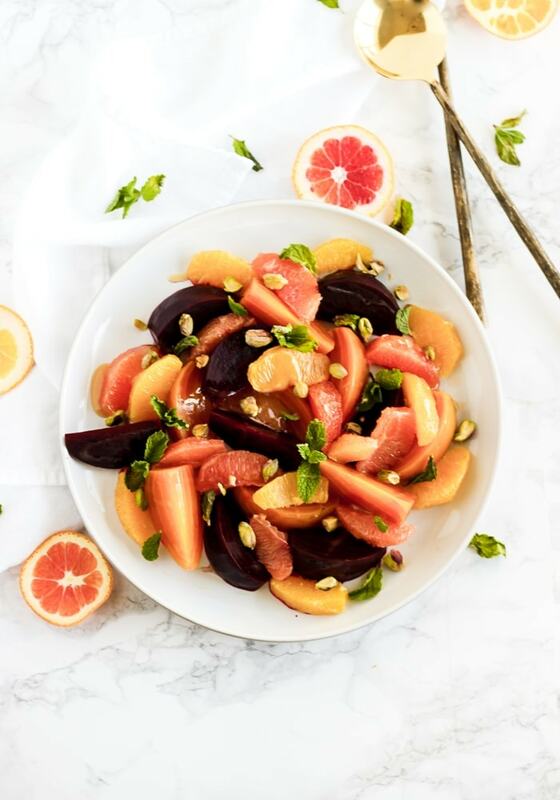 If you’re looking for something a little different from your normal fruit and veggie routine, you HAVE to try this pretty citrus beet salad. 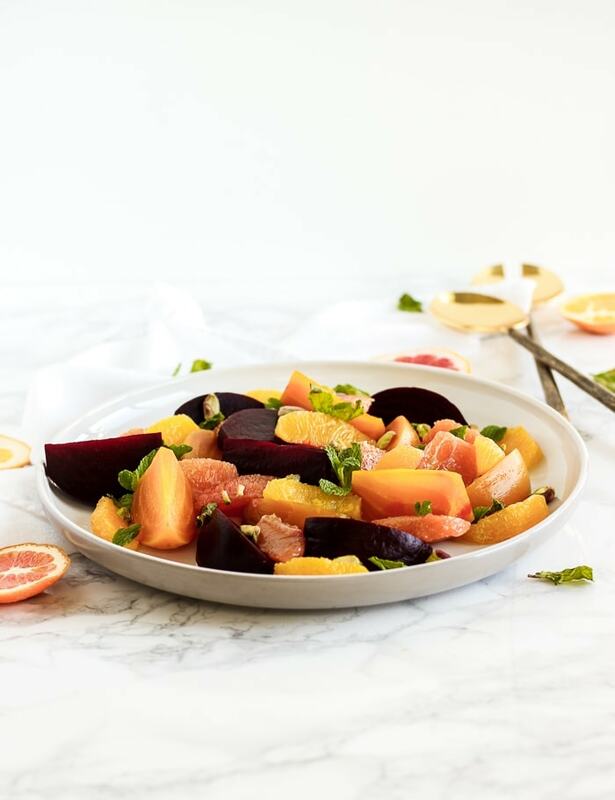 With the lovely texture and subtle earthy sweetness of roasted beets and the juicy tang of 3 types of winter oranges, all in gorgeous hues, this salad is sure to make both your table setting and your taste buds pop. A drizzle of honey and olive oil, a sprinkle of crunchy pistachios and fresh mint, and just a bit of sea salt tie it all together just beautifully. And there’s not even one leaf of lettuce present. Who said salads are boring? They’re never boring when you can make salads this gorgeous and flavorful! 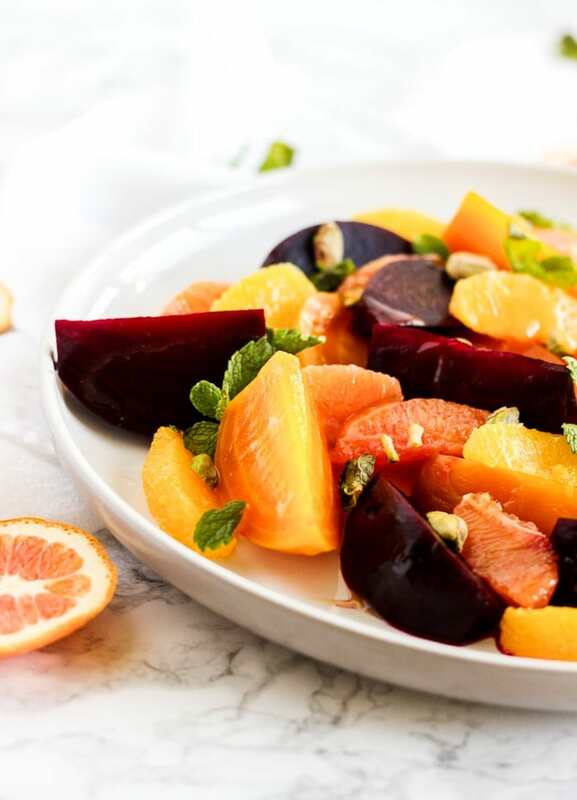 This citrus beet salad is loaded with nutrients. Oranges are full of immune-boosting vitamin C (as I’m sure you know), as well as folate and potassium. Beets contain vitamin C, iron, folate, magnesium, and potassium. Both are loaded with antioxidants, too. They’re the perfect pair, since iron absorption is enhanced by vitamin C, meaning your body gets more benefit when you eat them together. This salad is a lovely pairing with any dinner entrée, but it’s also delicious on its own. I like to put the leftovers on top plain Greek yogurt for a delicious lunch, or toss it with some leftover quinoa for extra whole grain goodness. 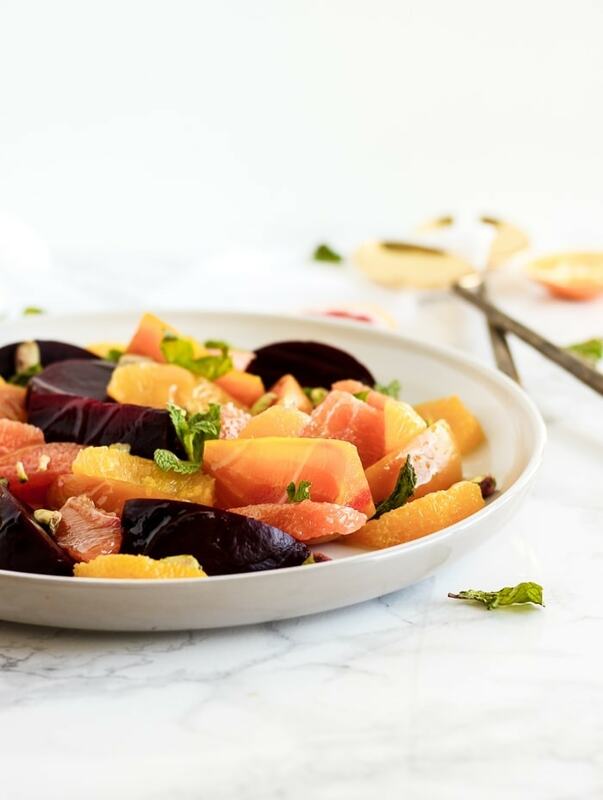 Any way you eat it, the beautiful colors in this gorgeous citrus beet salad are a welcome bright addition to liven up any table! Gently peel skin from beets and slice into wedges. Arrange beets on a platter. 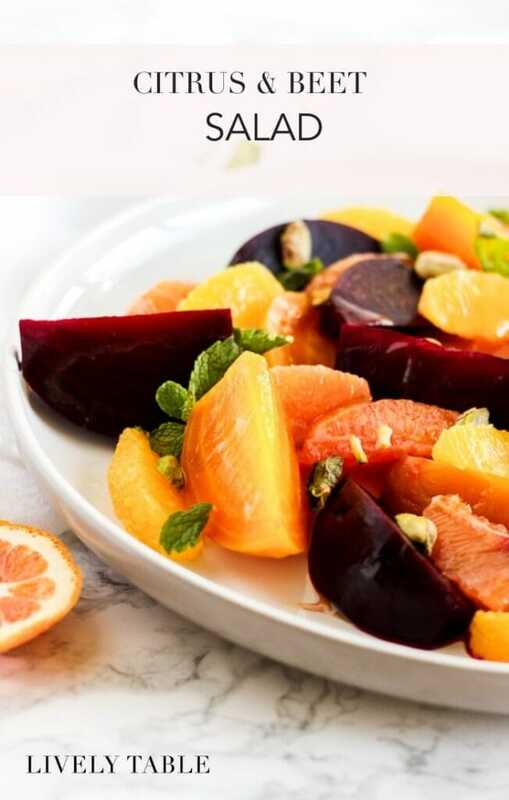 Arrange citrus segments around beets. Sprinkle with mint and pistachios. Drizzle with honey and oil and sprinkle with coarse sea salt. Serve.